Homemade baby/toddler blankets, loveys, and taggies. 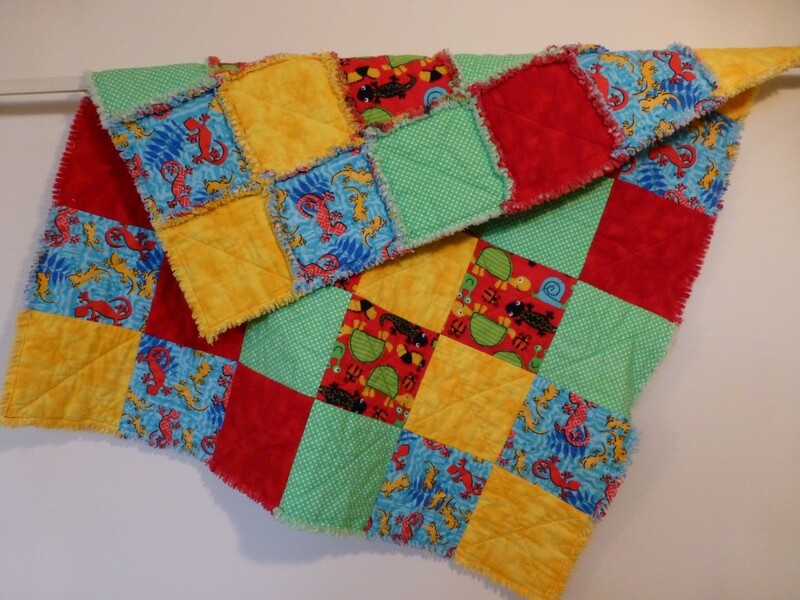 These baby rag quilts are made with a combination of solid and patterned 100% cotton flannel. 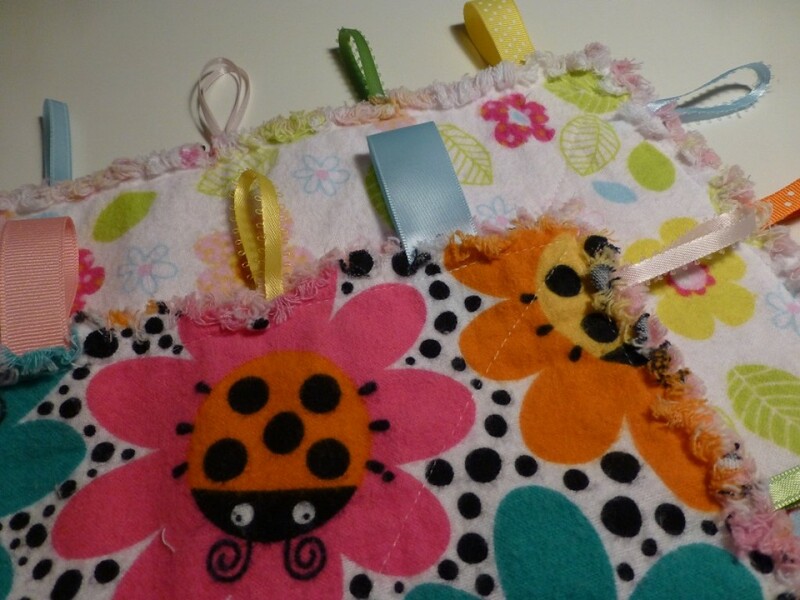 The squares are sewn together with an “X” in a coordinating thread color and contain a layer of Warm & Natural in the middle. These blankets have been washed once to start the ragging process. Each wash will enhance the ragging. These blankets are made in a smoke-free and pet-free environment. The dimensions are approximately 34” x 34”. The pattern on the front and back is exactly the same. It is recommended that you wash these blankets in cold water and use a dryer rather than line drying. These mini baby rag quilts are made with a combination of solid and patterned 100% cotton flannel. These blankets have been washed once to start the ragging process. Each wash will enhance the ragging. These blankets, while small, have many possible uses. 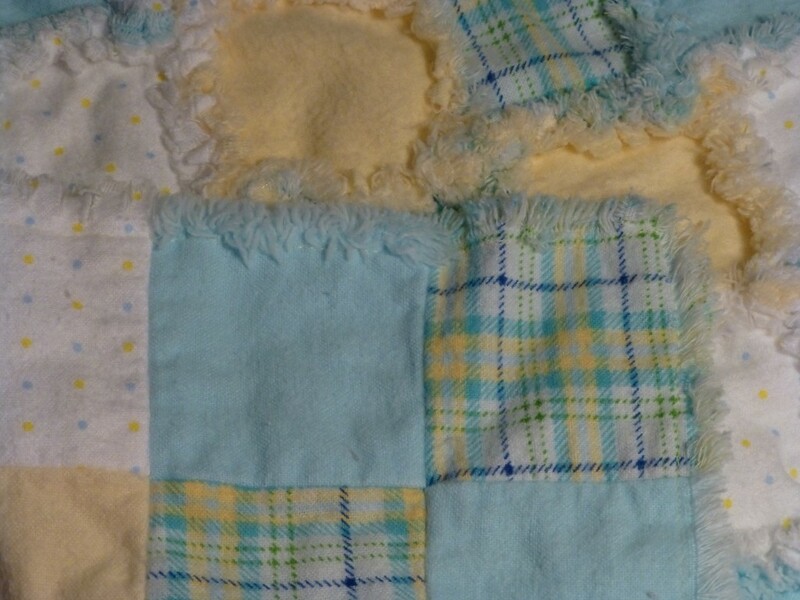 They are perfect for covering a newborn while holding him/her on your chest, sending off to daycare with your baby or toddler (far easier to wash than his/her regular blanket), or great for your little one to use as a doll blanket during play time. The dimensions are approximately 15” x 15”. The pattern on the front and back is exactly the same. Get these blankets for $15 when you also purchase a 34” square baby blanket. 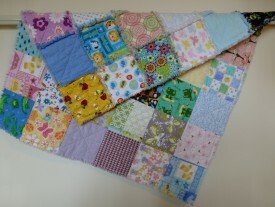 These baby rag quilts are made with a random selection of patterned fabrics. No two squares are the same. The squares are made of 100% cotton flannel, sewn together with an “X” in a coordinating thread color, and contain a layer of Warm & Natural in the middle. These blankets have been washed once to start the ragging process. Each wash will enhance the ragging. These mini baby rag quilts are made with a random selection of patterned fabrics. No two squares are the same. 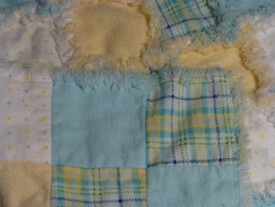 The squares are made of 100% cotton flannel. These blankets have been washed once to start the ragging process. Each wash will enhance the ragging. Get these blankets for $15 when you also purchase a 34” square blanket. The rag taggie blankets are reversible with a different patterned 100% cotton flannel fabric on each side and a layer of solid flannel in the middle. This blanket has been washed once to start the ragging process. Each wash will enhance the ragging. This blanket, while small, has many possible uses. It provides great tactile and visual stimulation for all young children, perfect for covering a newborn while holding him or her on your chest, sending off to daycare with your baby or toddler (far easier to wash than a regular blanket), or great for your little one to use as a doll blanket during play time. 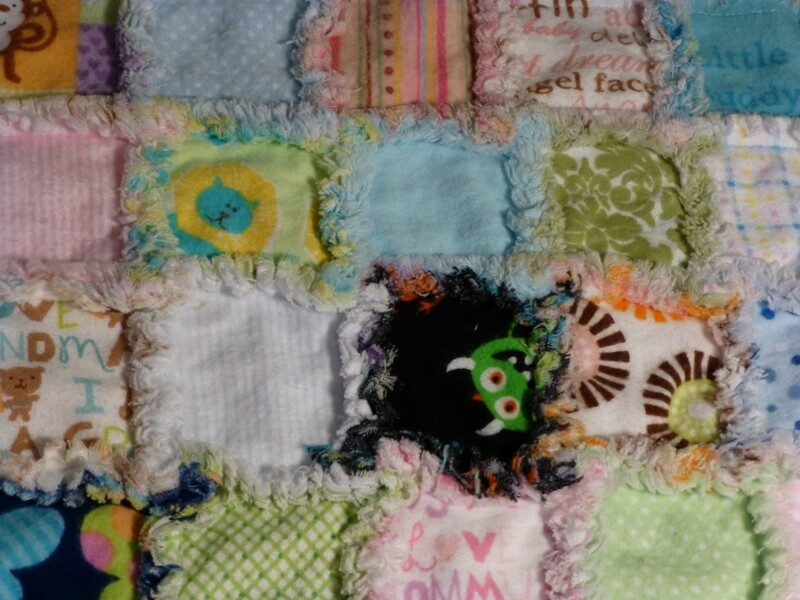 This blanket was made in a smoke-free and pet-free environment. The dimensions are approximately 13” x 13” and the ribbons extend approximately 2” from the edge. It is recommended that you wash this blanket in cold water and use a dryer rather than line drying. Get this blanket for $15 when you also purchase a 34” square blanket.